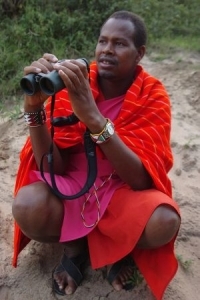 Jackson Ole Looseyia is one of the best wildlife guides in Africa. He grew up surrounded by wildlife and from an early age found it a source of inspiration. Tracking wild animals is in his blood – he comes from a long line of hunters and trackers. His has an extraordinary life-story. His education is part hunter-gatherer, part Maasai, part Catholic. Jackson’s father was not a Maasai, he was a hunter-gatherer. His people were moved by the authorities from central Kenya to the Mara, where he continued to hunt. This was not legal in the Mara and his Father was caught and imprisoned for eight years. When he was caught a third time, the warden wisely appointed him head ranger in the Southern Mara! The perfect ranger is a former hunter. It was at this time that Jackson was trained in the ways of the wild – his father took him into the heart of the bush for six months field training. During this time he was shown how to track dangerous animals such as lion and buffalo. The trip had dramatic consequences as during the adventure, Jackson’s father was attacked by a buffalo and had his right hand broken. Responsibility for the family was handed to Jackson. Jackson’s fate now took a dramatic turn. Ron Beaton was owner of some safari cottages in the Mara and knew Jackson’s father. He offered to train Jackson as a guide. In the 1980s there were no Maasai guides working in the Mara and so this was very innovative. For seven years Ron apprenticed Jackson before he allowed him to guide alone. There was no stopping Jackson now. His horizons were broadening and he continued to acquire a remarkable breadth of skills and now moves easily between different worlds; the perfect host and expert guide, working in remote villages promoting conservation and education, research, training, television presenting. Jackson now owns a camp in The Mara with his old school friend Dominic Nchoe and hosts private safaris. In any role he carries the same quiet authority, eloquence and his love for nature, especially big cats. He has an intimate knowledge of all the wildlife in the Mara from the smallest insect to the largest predators, but the big cats are his particular favourites. especially the elusive leopard which Jackson describes as “an animal work of art”. 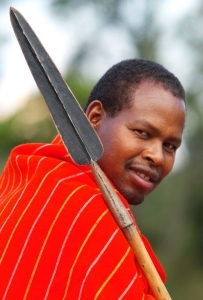 Jackson is an ambassador: expressing modern conservation ideas to Maasai communities and explaining Maasai values to travellers – always with eloquence and humour. His training and experience is being passed on through his strong commitment to school education in the Mara area and guiding visitors to The Mara. His love of all creatures great and small, his respect for nature and his Maasai traditions make jackson and exceptional safari guide. The Mara is his office, where he works every day watching and following the big cats. He knows every mound, bush and river. Little wonder that he was brought in to enhance the popular BBC series Big Cat Live’. Olive and her leopard family were even named after him – ‘The Jackson Five’. Jackson lives and breaths The Mara and writes regularly about it in his Blog, – check it out for updates on the Marsh Pride of Lions and other big cats. We have been working with Jackson as our special Mara host on our private Big Cat safaris for a number of years. On some of these safaris he co-hosted with Simon King. October 2015, and we are just back from one of our best safaris ever to the Mara. To read of our adventures with Jackson, and to see some of our sightings, click here. 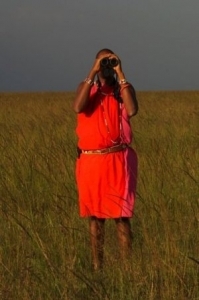 Join Jackson on safari in the Masai Mara.